Before designer Claudia Giselle of New York City-based Claudia Giselle Design stepped in, this glamorous and open bathroom was dark, dated and dysfunctional. The toilet was the first item in sight upon entering the bathroom. Giselle proposed swapping the location of that and the vanity for a more appealing entrance and more storage space. The former vanity area was not only tiny but was also covered in 1960s-dated pink tiles. By changing out the enclosed shower wall for glass, Giselle immediately opened up the bath to more light and space. Marble countertops – as well as marble tiles on the floor, walls and ceiling – give the bath a luxurious and welcoming tone. The racessed niche in the shower adds function, depth and style. All the wood, textile and stone are working harmoniously, creating visual interest without making the space feel busy. When New York City-based designer Claudia Giselle first saw this bath, she knew immediately it had the potential to wow its homeowners. However, the original layout failed to optimize the space, and the result was a dark and dingy space – a far cry from the oasis the homeowners wanted. One of the fundamental problems with the bath was the improper layout. The toilet was the first visible element when entering the room, there wasn’t enough storage, and the shower was completely enclosed on three sides by walls. When she designs a bathroom, hand-drawn plans and elevations are often enough to illustrate the design concept. However, for this project, the design team used SketchUp for the 3D drawings. These new sightlines start with the frameless glass shower enclosure. The previous shower only let natural light in through the doorframe, and the walls surrounding it made the bath appear smaller. 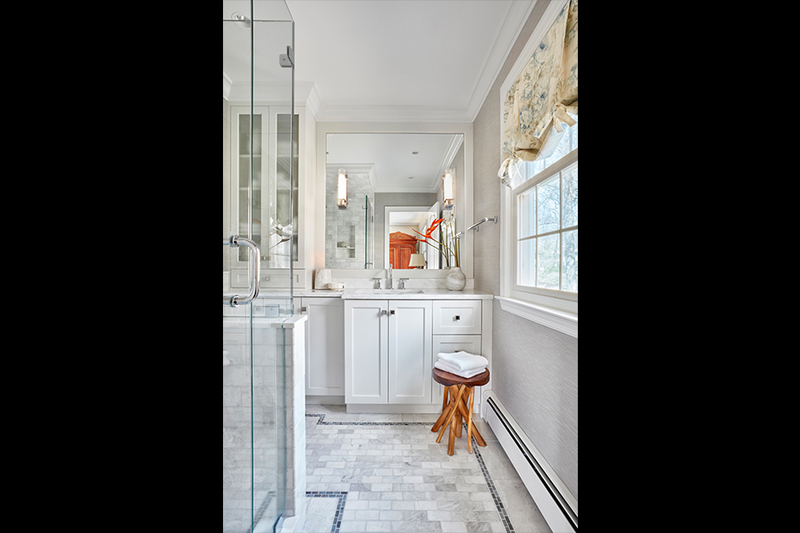 The new enclosure instead allows for uninterrupted views of the bathroom, while a half-wall conceals the toilet from view upon entering the bathroom. A wide glass mirror behind the vanity – now the center of attention when entering the room – also visually enlarges the space. 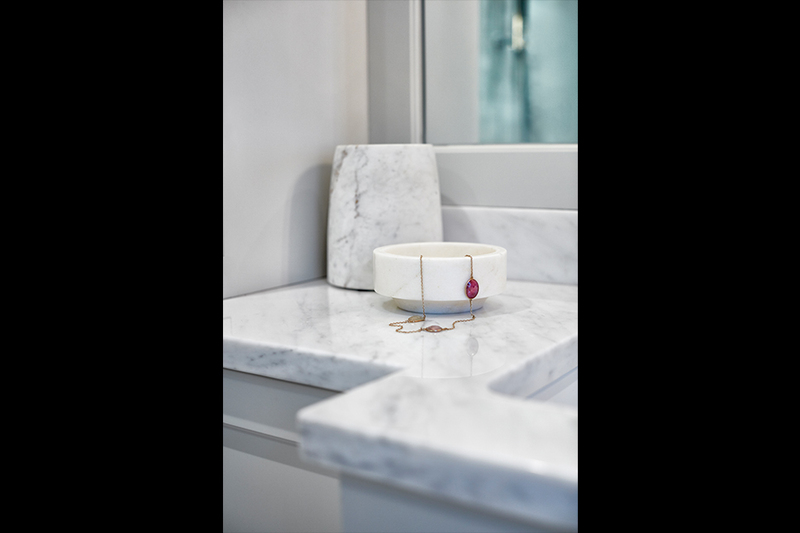 The marble countertop on the vanity extends from wall to wall, adding countertop space and depth to the bath. “In essence, we are creating layers that complement each other and add dimension,” said Giselle. The vanity itself boasts white-painted, wood cabinetry with recessed fronts, as well as an opaque glass for the upper cabinets. The hardware in the bathroom is nickel, which pulls out the silver veins in the marble countertops. The marble continues with giant tiles on the walls, floor and ceiling in the shower. 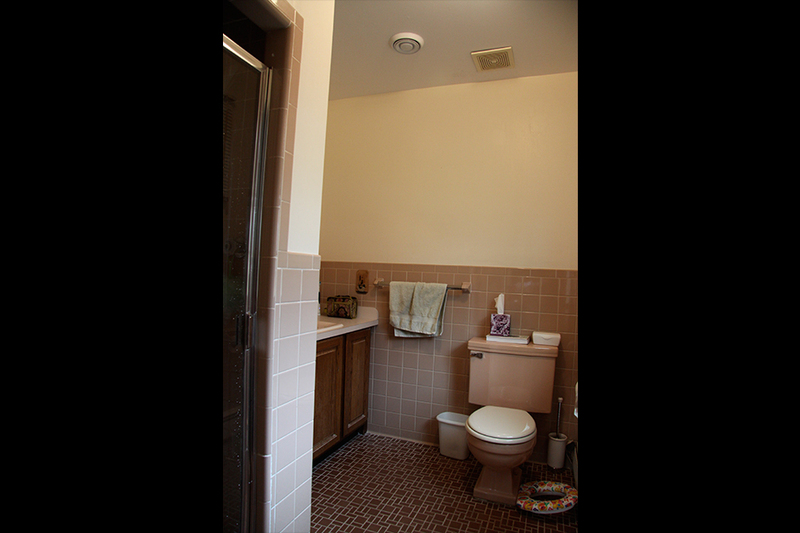 However, the wall tile is larger than the tile on the floor, and an accent mosaic tile was added as a border around the entire room. Above the stone tile wall, a light gray, woven textile adds texture to the bathroom without creating visual clutter.